Brian Vandewalle, AICP, President, Principal Planner | Vandewalle & Associates, Inc. Educated at Ball State University in the College of Architecture & Planning, Brian amassed a wide range of planning experience working in the public sector before establishing the team of Vandewalle & Associates—now a well-respected urban planning, economic redevelopment, and design consulting firm known for producing some of the most visionary and impactful land use plans in the country. Brian is the Master Planner responsible for American Family’s Madison headquarters and campus and for the Caterpillar Headquarters in East Peoria. He has served as master planner to the Quad Cities, for John Deere for over 25 years, and for the Milwaukee County Grounds Research Park/Milwaukee Regional Medical Center for over 20 years. While carefully building a guild-like, multi-disciplinary team over several decades, Brian has led the firm’s development of a comprehensive approach to economic repositioning which integrates planning, design, and market analysis while skillfully leveraging the area’s land, cultural, and human assets. He pursues a purpose of creatively rebuilding and retooling post-industrial central cities and economies, helping them emerge stronger through the tides of change. 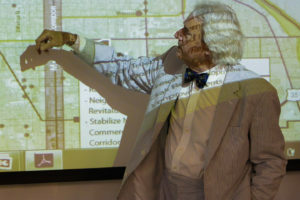 He is a highly sought-after expert at using redevelopment tools to build tax base, eliminate blight, and create new urban housing and employment opportunities. The developments that result are long-range efforts that are standing the test of time as sustainable examples of market-driven design. With his finger on the pulse of the region’s emerging technologies and economic sectors, Brian synthesizes market dynamics with deep knowledge of communities and a broad experience working with urban centers to craft new, place-based economies that are future-ready. Beyond planning, Brian provides expertise bringing projects to implementation and fruition by generating consensus, forging partnerships, making key government and business linkages, determining financing sources, and recruiting end-users for urban development and redevelopment. Brian is also a licensed real estate broker in the State of Wisconsin, and professionally practices commercial and industrial brokerage. This hands-on experience with project tenants and buyers helps him combine a sense of planning vision with a very realistic perspective on project feasibility. Brian was awarded the “Best of Madison Business” in 2005 for his visionary work on the Madison, Wisconsin Mayor’s “Healthy City” economic development initiative. In recent years, Brian has grown into a serial entrepreneur, harnessing local assets and turning them into a series of small entrepreneurial side businesses including a hotel, coffee house, restaurant and culinary school, spirits and distillery company. He continues to nurture and guide new talent at Vandewalle as he advises on economic development, redevelopment, retooling and repositioning projects for companies, cities and regions, touching virtually every project that moves through both the Madison and Milwaukee offices of Vandewalle & Associates.